For Hawaiians involved with agriculture, there were three types of land available for growing crops. Ko Kaha Kai was land along the shoreline. Kula lands were on the lands above the shoreline. Kahawai lands were in the valleys, where fresh water could also be obtained. The land area with which the Polynesian migrant first became familiar was of necessity that along shore, wherever his voyaging canoe made its landfall. This area he termed Ko Kaha Kai (place [land] by the sea). This might comprise a broad sandy beach and the flats above it, or the more rugged shore of cove or harbor with its rocky terrain-in fact many and varied descriptions might fit, according to locale. Kaha was a special term applied to areas facing the shore but not favorable for planting. Kekaha in Kona, Hawaii, was one so named, and Kekaha on Kauai another. The ko kaha kai was not without its own verdure of a sort, however. In fact the terrain just above the sandy stretches (pu‘eone) was often called ‘ilima, because of the low-growing, gray-foliaged, golden-flowering ‘ilima bushes found in abundance there. Pohuehue, the beach morningglory, also had its natural habitation there, along with ‘auhuhu, whose leaves yielded a juice used to stupefy fish for ready catching in the inlets and sea pools. Next above were the plains or sloping lands (kula), those to seaward being termed ko kula kai and those toward the mountains ko kula uka (uka, inland or upland). Here were the great stretches of waving pili grass, which was used to make the thick rain-repellent thatch for dwellings (hale). Before cultivation took over the area, the carpeting grass was interspersed with vines (such as the koali, morning-glory) and many shrubs, all of which found practical uses by the immigrant folk. There were also a few stunted trees. On the ko kula uka, the upland slopes, were found the native ginger and other flowering plants, medicinal herbs, and thick-growing clumps of shrubs. Here too the great variety of trees attained to greater height, and their wood became the source of valuable materials for many necessities of life. This word kula, used by Hawaiians for sloping land between mountain and sea, really meant plain or sloping land without trees. There is a large land area in the southerly kula slopes of East Maui that is named Honua-‘ula (Red-earth). Some kula lands, such as those of southern and eastern Hawaii and the southern slopes of Haleakala on Maui, were covered with lava or soil evolved from the dust of recent volcanic eruptions. The red soil is oldest geologically, having evolved from decomposed basalt oxidized by sun, rain, and air. Next in age is the humus of valley bottoms. Most recent is decomposed lava, such as is typical of Kona, Kā‘u, Hilo, and Puna on Hawaii, and of some areas on the southern slope of Haleakala on East Maui. This was the kahawai, ‘the place [having] fresh water’ – in other words, the valley stretching down from the forested uplands, carved out and made rich in humus by its flowing stream. Here he could find (or make) level plots for taro terraces, diverting stream water by means of ‘auwai (ditches) into the lo‘i, or descending series of lo‘i until from below the whole of the visible valley afforded a scene of lush green cultivation amidst fresh water glinting in the sun. The planter might have his main dwelling here, or he might dwell below and maintain here only a shelter to use during periods of intensive cultivation in the kahawai. Here also was a source of many of his living needs and luxuries, from medicinal herbs to flowers for decorative garlands, and with a wide range in between. This area he termed ko kaha kai (place (land) by the sea). This might comprise a broad sandy beach and the flats above it, or the more rugged shore of cove or harbor with its rocky terrain-in fact many and varied descriptions might fit, according to locale. Kaha was a special term applied to areas facing the shore but not favorable for planting. Kekaha in Kona, Hawaii, was one so named, and Kekaha on Kauai another. The ko kaha kai was not without its own verdure of a sort, however. In fact the terrain just above the sandy stretches (pu‘eone) was often called ‘ilima, because of the low-growing, gray-foliaged, golden-flowering ‘ilima bushes found in abundance there. Pohuehue, the beach morning-glory, also had its natural habitation there, along with ‘auhuhu., whose leaves yielded a juice used to stupefy fish for ready catching in the inlets and sea pools. In fact most of the varied low growth of the ko kaha kai found use in the planter’s or fisher’s economy. Most recent is decomposed lava, such as is typical of Kona, Ka’u, Hilo, and Puna on Hawaii, and of some areas on the southern slope of Haleakalā on East Maui. This was the kahawai (the place (having) fresh water,) in other words, the valley stretching down from the forested uplands, carved out and made rich in humus by its flowing stream. The planter might have his main dwelling here, or he might dwell below and maintain here only a shelter to use during periods of intensive cultivation in the kahawai. Here also was a source of many of his living needs and luxuries, from medicinal herbs to flowers for decorative garlands, and with a wide range in between. Two other descriptive terms applied to land areas, one belonging to the kahawai and one not. The first was pahe‘e, meaning a wet, soft, or slippery area; and the other was apa‘a, meaning arid or dry. From its derivative (pa‘a) meaning firmly bound, the latter became a term of affection for land long lived upon. Wao means the wild – a place distant and not often penetrated by man. The wao la‘au is the inland forested region, often a veritable jungle, which surmounts the upland kula slopes on every major island of the chain, reaching up to very high elevations especially on Kauai, Maui, and Hawai‘i. The Hawaiians recognized and named many divisions or aspects of the wao: first, the wao kanaka, the reaches most accessible, and most valuable, to man (kanaka;) and above that, denser and at higher elevations, the wao akua, forest of the gods, remote, awesome, seldom penetrated, source of supernatural influences, both evil and beneficent. The wao kele, or wao ma‘u kele, was the rain forest. Here grew giant trees and tree ferns (‘ama‘u) under almost perpetual cloud and rain. … candlenuts (kukui) for oil and lights; wild yams and roots for famine time; sandalwood, prized when shaved or ground as a sweet scent for bedding and stored garments. These and innumerable other materials were sought and found and worked by man in or from the wao. The campaign against tuberculosis was inaugurated in Hawaii in 1909 as a result of the interest of James A Rath and others at Pālama Settlement in Honolulu. Stimulated by the Anti-Tuberculosis League of Hawaiʻi, interest steadily grew – the Territorial Government took over the program in 1920. The first patients were admitted into the then-named Maui County Farm and Sanitarium on September 14, 1910. The June 1911 Official Patient Report reported 12-patients; over the years, the ethnicity of the patients reflected the Islands’ growing diversity, Americans, Australians, Hawaiians, Chinese, Japanese, Koreans, Filipinos, Porto Ricans, Portuguese and Norwegian. In 1926, children were admitted into the Preventorium. 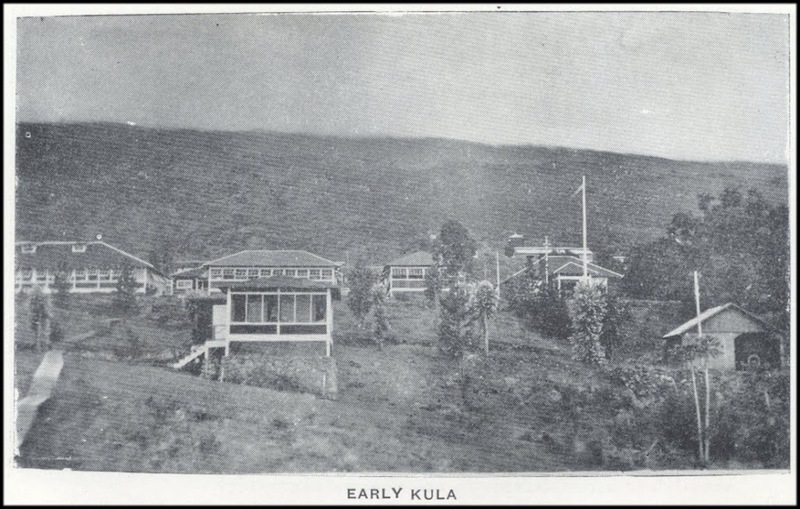 The overall facility was expanded into the Charles William Dickey-designed Kula Sanatorium (one of the largest designed by Dickey in his career,) with the first patients moving in on May 27, 1937. The layout of the gardens at Kula Sanatorium was a combination of formal plantings and careful use of indigenous plantings. They were designed by the first registered landscape architect in Hawaii, Catherine Jones Thompson and her husband, Robert O Thompson. In the 1950s when drugs were developed to control tuberculosis, Kula Sanatorium changed its focus to serving long-term care patients. In 1960, psychiatric patients were admitted on an experimental basis. In 1975, tuberculosis services were discontinued and on April 9, 1976, the complex was renamed Kula Hospital. The Kula Hospital & Clinic is a five story Moderne style hospital (“traditionalism and modernism” popular from 1925 through the 1940s) that serves as a general hospital and clinic to residents within the Kula area. The complex has acute care beds, 24-hour emergency room and outpatient clinic with lab and x-ray services. Kula Hospital continues to provide long-term care for its residents. The image shows an early image of facilities at Lula Sanitarium. In addition, I have added related images in a folder of like name in the Photos section on my Facebook and Google+ pages.